From Twenty Years of Congress: From Lincoln to Garfield. With a review of the events which led to the political revolution of 1860, by James G. Blaine. Vol. II, pp. 681-682. An Act to provide for the more efficient government of the rebel states. Be it enacted, &c., That said rebel States shall be divided into military districts and made subject to the military authority of the United States, as hereinafter prescribed, and for that purpose Virginia shall constitute the first district; North Carolina and South Carolina the second district; Georgia, Alabama, and Florida the third district; Mississippi and Arkansas the fourth district; and Louisiana and Texas the fifth district. Sec. 2. That it shall be the duty of the President to assign to the command of each of said districts an officer of the army, not below the rank of brigadier-general, and to detail a sufficient military force to enable such officer to perform his duties and enforce his authority within the district to which he is assigned. Sec. 3. That it shall be the duty of each officer assigned as aforesaid to protect all persons in their rights of person and property, to suppress insurrection, disorder, and violence, and to punish, or cause to be punished, all disturbers of the public peace and criminals, and to this end he may allow local civil tribunals to take jurisdiction of and to try offenders, or, when in his judgment it may be necessary for the trial of offenders, he shall have power to organize military commissions or tribunals for that purpose; and all interference under color of State authority with the exercise of military authority under this act shall be null and void. Sec. 4. That all persons put under military arrest by virtue of this act shall be tried without unnecessary delay, and no cruel or unusual punishment shall be inflicted; and no sentence of any military commission or tribunal hereby authorized, affecting the life or liberty of any person, shall be executed until it is approved by the officer in command of the district, and the laws and regulations for the government of the army shall not be affected by this act, except in so far as they conflict with its provisions: Provided, That no sentence of death under the provisions of this act shall be carried into effect without the approval of the President. Sec. 5. That when the people of any one of said rebel States shall have formed a constitution of government in conformity with the Constitution of the United States in all respects, framed by a convention of delegates elected by the male citizens of said State twenty-one years old and upward, of whatever race, color, or previous condition, who have been resident in said State for one year previous to the day of such election, except such as may be disfranchised for participation in the rebellion, or for felony at common law, and when such constitution shall provide that the elective franchise shall be enjoyed by all such persons as have the qualifications herein stated for electors of delegates, and when such constitution shall be ratified by a majority of the persons voting on the question of ratification who are qualified as electors for delegates, and when such constitution shall have been submitted to Congress for examination and approval, and Congress shall have approved the same, and when said State, by a vote of its legislature elected under said constitution, shall have adopted the amendment to the Constitution of the United States, proposed by the Thirty-Ninth Congress, and known as article fourteen, and when said article shall have become a part of the Constitution of the United States, said State shall be declared entitled to representation in Congress, and Senators and Representatives shall be admitted therefrom on their taking the oaths prescribed by law, and then and thereafter the preceding sections of this act shall be inoperative in said State: Provided, That no person excluded from the privilege of holding office by said proposed amendment to the Constitution of the United States shall be eligible to election as a member of the convention to frame a constitution for any of said rebel States, nor shall any such person vote for members of such convention. Sec. 6. That until the people of said rebel states shall be by law admitted to representation in the Congress of the United States, any civil governments which may exist therein shall be deemed provisional only, and in all respects subject to the paramount authority of the United States at any time to abolish, modify, control, or supersede the same; and in all elections to any office under such provisional governments all persons shall be entitled to vote, and none others, who are entitled to vote under the provisions of the fifth section of this act; and no person shall be eligible to any office under any such provisional governments who would be disqualified from holding office under the provisions of the third article of said constitutional amendment. From Twenty Years of Congress: From Lincoln to Garfield. With a review of the events which led to the political revolution of 1860, by James G. Blaine. Vol. II, pp. 682-685. An Act supplementary to an act entitled "An act to provide for the more efficient government of the rebel states," passed March second, eighteen hundred and sixty-seven, and to facilitate restoration. Be it enacted, &c., That before the first day of September, eighteen hundred and sixty-seven, the commanding general in each district defined by an act entitled "An Act to provide for the more efficient government of the rebel States," passed March second, eighteen hundred and sixty-seven, shall cause a registration to be made of the male citizens of the United States, twenty-one years of age and upwards, resident in each county or parish in the State or States included in his district, which registration shall include only those persons who are qualified to vote for delegates by the act aforesaid, and who shall have taken and subscribed the following oath or affirmation: "I, _____, do solemnly swear, (or affirm,) in the presence of Almighty God, that I am a citizen of the State of _____; that I have resided in said State for _____ months next preceding this day, and now reside in the county of _____, or the parish of _____, in said State, (as the case may be;) that I am twenty-one years old; that I have not been disfranchised for participation in any rebellion or civil war against the United States, nor for felony committed against the laws of any State or of the United States; that I have never been a member of any State legislature, nor held any executive or judicial office in any State and afterwards engaged in insurrection or rebellion against the United States, or given aid or comfort to the enemies thereof; that I have never taken an oath as a member of Congress of the United States, or as an officer of the United States, or as a member of any State legislature, or as an executive or judicial officer of any State, to support the Constitution of the United States, and afterwards engaged in insurrection or rebellion against the United States or given aid or comfort to the enemies thereof; that I will faithfully support the Constitution and obey the laws of the United States, and will, to the best of my ability, encourage others so to do, so help me God;" which oath or affirmation may be administered by any registering officer. Sec. 2. That after the completion of the registration hereby provided for in any State, at such time and places therein as the commanding general shall appoint and direct, of which at least thirty days' public notice shall be given, an election shall be held of delegates to a convention for the purpose of establishing a constitution and civil government for such state loyal to the Union, said convention in each State, except Virginia, to consist of the same number of members as the most numerous branch of the State legislature of such State in the year eighteen hundred and sixty, to be apportioned among the several districts, counties, or parishes of such State by the commanding general, giving to each representation in the ratio of voters registered as aforesaid, as nearly as may be. The convention in Virginia shall consist of the same number of members as represented the territory now constituting Virginia in the most numerous branch of the legislature of said State in the year eighteen hundred and sixty, to be apportioned as aforesaid. Sec. 3. That at said election the registered voters of each State shall vote for or against a convention to form a constitution therefor under this act. Those voting in favor of such a convention shall have written or printed on the ballots by which they vote for delegates, as aforesaid, the words "For a convention," and those voting against such a convention shall have written or printed on such ballots the words "Against a convention." The person appointed to superintend said election, and to make return of the votes given thereat, as herein provided, shall count and make return of the votes given for and against a convention; and the commanding general to whom the same shall have been returned shall ascertain and declare the total vote in each State for and against a convention. If a majority of the votes given on that question shall be for a convention, then such convention shall be held as hereinafter provided; but if a majority of said votes shall be against a convention, then no such convention shall be held under this act: Provided, That such convention shall not be held unless a majority of all such registered voters shall have voted on the question of holding such convention. Sec. 4. That the commanding general of each district shall appoint as many boards of registration as may be necessary, consisting of three loyal officers or persons, to make and complete the registration, superintend the election, and make return to him of the votes, lists of voters, and of the persons elected as delegates by a plurality of the votes cast at said election; and upon receiving said returns he shall open the same, ascertain the persons elected as delegates according to the returns of the officers who conducted said election, and make proclamation thereof; and if a majority of the votes given on that question shall be for a convention, the commanding general, within sixty days from the date of election, shall notify the delegates to assemble in convention, at a time and place to be mentioned in the notification, and said convention, when organized, shall proceed to frame a constitution and civil government according to the provisions of this act and the act to which is it supplementary; and when the same shall have been so framed, said constitution shall be submitted by the convention for ratification to the persons registered under the provisions of this act at an election to be conducted by the officers or persons appointed or to be appointed by the commanding general, as hereinbefore provided, and to be held after the expiration of thirty days from the date of notice thereof, to be given by said convention; and the returns thereof shall be made to the commanding general of the district. Sec. 5. That if, according to said returns, the constitution shall be ratified by a majority of the votes of the registered electors qualified as herein specified, cast at said election, (at least one half of all the registered voters voting upon the question of such ratification,) the president of the convention shall transmit a copy of the same, duly certified, to the President of the United States, who shall forthwith transmit the same to Congress, if then in session, and if not in session, then immediately upon its next assembling; and if it shall, moreover, appear to Congress that the election was one at which all the registered and qualified electors in the State had an opportunity to vote freely and without restraint, fear, or the influence of fraud, and if the Congress shall be satisfied that such constitution meets the approval of a majority of all the qualified electors in the State, and if the said constitution shall be declared by Congress to be in conformity with the provisions of the act to which this is supplementary, and the other provisions of said act shall have been complied with, and the said constitution shall be approved by Congress, the State shall be declared entitled to representation, and Senators and Representatives shall be admitted therefrom as therein provided. Sec. 6. That all elections in the States mentioned in the said "Act to provide for the more efficient government of the rebel States," shall, during the operation of said act, be by ballot; and all officers making the said registration of voters and conducting said elections shall, before entering upon the discharge of their duties, take and subscribe the oath prescribed by the act approved July second, eighteen hundred and sixty-two, entitled "An act to prescribe an oath of office:" Provided, That if any person shall knowingly and falsely take and subscribe any oath in this act prescribed, such person so offending and being thereof duly convicted, shall be subject to the pains, penalties, and disabilities which by law are provided for the punishment of the crime of wilful and corrupt perjury. Sec. 7. That all expenses incurred by the several commanding generals, or by virtue of any orders issued, or appointments made, by them, under or by virtue of this act, shall be paid out of any moneys in the treasury not otherwise appropriated. Sec. 8. That the convention for each State shall prescribe the fees, salary, and compensation to be paid to all delegates and other officers and agents herein authorized or necessary to carry into effect the purposes of this act not herein otherwise provided for, and shall provide for the levy and collection of such taxes on the property in such State as may be necessary to pay the same. Sec. 9. That the word article, in the sixth section of the act to which this is supplementary, shall be construed to mean section. From Twenty Years of Congress: From Lincoln to Garfield. With a review of the events which led to the political revolution of 1860, by James G. Blaine. Vol. II, pp. 685-687. An Act supplementary to an act entitled "An Act to provide for the more efficient government of the rebel states," passed on the second day of March, 1867, and the act supplementary thereto, passed on the 23d day of March, 1867. Be it enacted, &c., That it is hereby declared to have been the true intent and meaning of the act of the 2d day of March, 1867, entitled "An act to provide for the more efficient government of the rebel States," and of the act supplementary thereto, passed on the 23d day of March, 1867, that the governments then existing in the rebel States of Virginia, North Carolina, South Carolina, Georgia, Mississippi, Alabama, Louisiana, Florida, Texas, and Arkansas, were not legal State governments; and that thereafter said governments, if continued, were to be continued subject in all respects to the military commanders of the respective districts, and to the paramount authority of Congress. Sec. 2. That the commander of any district named in said act shall have power, subject to the disapproval of the General of the army of the United States, and to have effect till disapproved, whenever in the opinion of such commander the proper administration of said act shall require it, to suspend or remove from office, or from the performance of official duties and the exercise of official powers, any officer or person holding or exercising, or professing to hold or exercise, any civil or military office or duty in such district under any power, election, appointment, or authority derived from, or granted by, or claimed under, any so-called State or the government thereof, or any municipal or other division thereof; and upon such suspension or removal such commander, subject to the disapproval of the General as aforesaid, shall have power to provide from time to time for the performance of the said duties of such officer or person so suspended or removed, by the detail of some competent officer or soldier of the army, or by the appointment of some other person to perform the same, and to fill vacancies occasioned by death, resignation, or otherwise. Sec. 3. That the General of the army of the United States shall be invested with all the powers of suspension, removal, appointment, and detail granted in the preceding section to district commanders. Sec. 4. That the acts of the officers of the army already done in removing in said districts persons exercising the functions of civil officers, and appointing others in their stead, are hereby confirmed: Provided, That any person heretofore or hereafter appointed by any district commander to exercise the functions of any civil office, may be removed either by the military officer in command of the district, or by the General of the army. And it shall be the duty of such commander to remove from office, as aforesaid, all persons who are disloyal to the Government of the United States, or who use their official influence in any manner to hinder, delay, prevent, or obstruct the due and proper administration of this act and the acts to which it is supplementary. Sec. 5. That the boards of registration provided for in the act entitled "An act supplementary to an act entitled 'An act to provide for the more efficient government of the rebel States,' passed March 2, 1867, and to facilitate restoration," passed March 23, 1867, shall have power, and it shall be their duty, before allowing the registration of any person, to ascertain, upon such facts or information as they can obtain, whether such person is entitled to be registered under said act, and the oath required by said act shall not be conclusive on such question, and no person shall be registered unless such board shall decide that he is entitled thereto; and such board shall also have power to examine, under oath, (to be administered by any member of such board,) any one touching the qualification of any person claiming registration; but in every case of refusal by the board to register an applicant, and in every case of striking his name from the list as hereinafter provided, the board shall make a note or memorandum, which shall be returned with the registration list to the commanding general of the district, setting forth the grounds of such refusal or such striking from the list: Provided, That no person shall be disqualified as member of any board of registration by reason of race or color. Sec. 6. That the true intent and meaning of the oath prescribed in said supplementary act is, (among other things,) that no person who has been a member of the Legislature of any State, or who has held any executive or judicial office in any State, whether he has taken an oath to support the Constitution of the United States or not, and whether he was holding such office at the commencement of the rebellion, or had held it before, and who has afterwards engaged in insurrection or rebellion against the United States, or given aid or comfort to the enemies thereof, is entitled to be registered or to vote; and the words "executive or judicial office in any State" in said oath mentioned shall be construed to include all civil offices created by law for the administration of any general law of a State, or for the administration of justice. Sec. 7. That the time for completing the original registration provided for in said act may, in the discretion of the commander of any district, be extended to the 1st day of October, 1867; and the boards of registration shall have power, and it shall be their duty, commencing fourteen days prior to any election under said act, and upon reasonable public notice of the time and place thereof, to revise, for a period of five days, the registration lists, and, upon being satisfied that any person not entitled thereto has been registered, to strike the name of such person from the list, and such person shall not be allowed to vote. And such board shall also, during the same period, add to such registry the names of all persons who at that time possess the qualifications required by said act who have not been already registered; and no person shall, at any time, be entitled to be registered or to vote, by reason of any executive pardon or amnesty, for any act or thing which, without such pardon or amnesty, would disqualify him from registration or voting. Sec. 8. That section four of said last-named act shall be construed to authorize the commanding general named therein, whenever he shall deem it needful, to remove any member of a board of registration and to appoint another in his stead, and to fill any vacancy in such board. Sec. 9. 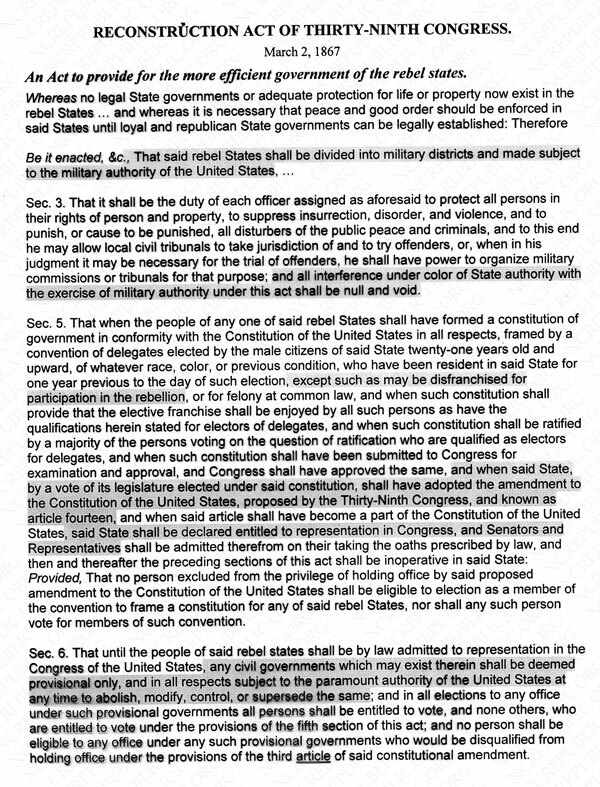 That all members of said boards of registration, and all persons hereafter elected or appointed to office in said military districts, under any so-called State or municipal authority, or by detail or appointment of the district commanders, shall be required to take and to subscribe the oath of office prescribed by law for officers of the United States. Sec. 10. That no district commander or member of the board of registration, or any of the officers or appointees acting under them, shall be bound in his action by any opinion of any civil officer of the United States. Sec. 11. That all the provisions of this act and of the acts to which this is supplementary shall be construed liberally, to the end that all the intents thereof may be fully and perfectly carried out. Twenty Years of Congress: From Lincoln to Garfield. With a review of the events which led to the political revolution of 1860, by James G. Blaine. Vol. II, p. 687. An Act to amend the act passed March 23, 1867, entitled "An Act supplementary to 'An act to provide for the more efficient government of the rebel states,' passed March 2, 1867, and to facilitate their restoration." Be it enacted, &c., That hereafter any election authorized by the act passed March 23, 1867, entitled "An Act supplementary to 'An act to provide for the more efficient government of the rebel states,' passed March 2, 1867, and to facilitate their restoration," shall be decided by a majority of the votes actually cast; and at the election in which the question of the adoption or rejection of any constitution is submitted, any person duly registered in the State may vote in the election district where he offers to vote when he has resided therein for ten days next preceding such election, upon presentation of his certificate of registration, his affidavit, or other satisfactory evidence, under such regulations as the district commanders may prescribe. Sec. 2. That the constitutional convention of any of the States mentioned in the acts to which this is amendatory may provide that at the time of voting upon the ratification of the constitution, the registered voters may vote also for members of the House of Representatives of the United States, and for all elective officers provided for by the said constitution; and the same election officers, who shall make the returns of the votes cast on the ratification or rejection of the constitution, shall enumerate and certify the votes cast for members of Congress. Be it enacted, &c., That hereafter every person elected or appointed to any office of honor or profit under the Government of the United States either in the civil, military, or naval departments of the public service, excepting the President of the United States, shall, before entering upon the duties of such office, and before being entitled to any of the salary or other emoluments thereof, take and subscribe the following oath or affirmation: "I, A B, do solemnly swear (or affirm), that I have never voluntarily borne arms against the United States since I have been a citizen thereof; that I have voluntarily given no aid, countenance, counsel, or encouragement to persons engaged in armed hostility thereto; that I have never sought nor accepted nor attempted to exercise the functions of any office whatever, under any authority or pretended authority, in hostility to the United States; that I have not yielded a voluntary support to any pretended government, authority, power, or constitution within the United States, hostile or inimical thereto; and I do further swear (or affirm) that, to the best of my knowledge and ability, I will support and defend the Constitution of the United States, against all enemies, foreign and domestic; that I will bear true faith and allegiance to the same; that I take this obligation freely, without any mental reservation or purpose of evasion, and that I will well and faithfully discharge the duties of the office on which I am about to enter; so help me God;" which said oath, so taken and signed, shall be preserved among the files of the Court, House of Congress, or Department to which the said office may appertain. And any person who shall falsely take the said oath shall be guilty of perjury, and on conviction, in addition to the penalties now prescribed for that offense, shall be deprived of his office, and rendered incapable forever after, of holding any office or place under the United States. From Twenty Years of Congress: From Lincoln to Garfield. With a review of the events which led to the political revolution of 1860, by James G. Blaine. Vol. I, pp. 603-605.
. . . "I come now to the point in your letter which is probably of the greatest practical importance. By the Act of 1807 you may employ such parts of the land and naval forces as you may judge necessary for the purpose of causing the laws to be duly executed, in all cases where it is lawful to use the militia for the same purpose. By the Act of 1795 the militia may be called forth 'whenever the laws of the United States shall be opposed, or the execution thereof obstructed, in any State by combinations too powerful to be suppressed by the ordinary course of Judicial proceedings, or by the power vested in the marshals.' This imposes upon the President the sole responsibility of deciding whether the exigency has arisen which requires the use of military force, and in proportion to the magnitude of that responsibility will be his care not to overstep the limits of his legal and just authority. "The laws referred to in the Act of 1795 are manifestly those which are administered by the judges, and executed by the ministerial officers of the courts for the punishment of crime against the United States, for the protection of rights claimed under the Federal Constitution and laws, and for the enforcement of such obligations as come within the cognizance of the Federal Judiciary. To compel obedience to these laws, the courts have authority to punish all who obstruct their regular administration, and the marshals and their deputies have the same powers as sheriffs and their deputies in the several States in executing the laws of the States. These are the ordinary means provided for the execution of the laws; and the whole spirit of our system is opposed to the employment of any other, except in cases of extreme necessity arising out of great and unusual combinations against them. Their agency must continue to be used until their incapacity to cope with the power opposed to them shall be plainly demonstrated. It is only upon clear evidence to that effect that a military force can be called into the field. Even then its operations must be purely defensive. It can suppress only such combinations as are found directly opposing the laws and obstructing the execution thereof. It can do no more than what might and ought to be done by a civil posse, if a civil posse could be raised large enough to meet the same opposition. On such occasions, especially, the military power must be kept in strict subordination to the civil authority, since it is only in aid of the latter that the former can act at all. "But what if the feeling in any State against the United States should become so universal that the Federal officers themselves (including judges, district attorneys, and marshals) would be reached by the same influences, and resign their places? Of course, the first step would be to appoint others in their stead, if others could be got to serve. But in such an event, it is more than probable that great difficulty would be found in filling the offices. We can easily conceive how it might become altogether impossible. We are therefore obliged to consider what can be done in case we have no courts to issue judicial process, and no ministerial officers to execute it. In that event troops would certainly be out of place, and their use wholly illegal. If they are sent to aid the courts and marshals, there must be courts and marshals to be aided. Without the exercise of those functions which belong exclusively to the civil service, the laws cannot be executed in any event, no matter what may be the physical strength which the Government has at its command. Under such circumstances to send a military force into any State, with orders to act against the people, would be simply making war upon them. "The existing laws put and keep the Federal Government strictly on the defensive. You can use force only to repel an assault on the public property and aid the Courts in the performance of their duty. If the means given you to collect the revenue and execute the other laws be insufficient for that purpose, Congress may extend and make them more effectual to those ends. "If one of the States should declare her independence, your action cannot depend on the rightfulness of the cause upon which such declaration is based. Whether the retirement of the State from the Union be the exercise of a right reserved in the Constitution, or a revolutionary movement, it is certain that you have not in either case the authority to recognize her independence or to absolve her from her Federal obligations. Congress, or the other States in Convention assembled, must take such measures as may be necessary and proper. In such an event, I see no course for you but to go straight onward in the path you have hitherto trodden — that is, execute the laws to the extent of the defensive means placed in your hands, and act generally upon the assumption that the present constitutional relations between the States and the Federal Gevernment continue to exist, until a new code of things shall be established either by law or force. To execute the laws of the Union; that is, to aid the Federal officers in the performance of their regular duties. To suppress insurrections against the State; but this is confined by Article 4, Section 4, to cases in which the State herself shall apply for assistance against her own people. To repel the invasion of a State by enemies who come from abroad to assail her in her own territory. All these provisions are made to protect the States, not to authorize an attack by one part of the country upon another; to preserve the peace, and not to plunge them into civil war. Our forefathers do not seem to have thought that war was calculated 'to form a more perfect Union, establish justice, insure domestic tranquility, provide for the common defense, promote the general welfare, and secure the blessings of liberty to ourselves and our posterity.' There was undoubtedly a strong and universal conviction among the men who framed and ratified the Constitution, that military force would not only be useless, but pernicious, as a means of holding the States together. "If it be true that war cannot be declared, nor a system of general hostilities carried on by the Central Government against a State, then it seems to follow that an attempt to do so would be ipso facto an expulsion of such State from the Union. Being treated as an alien and an enemy, she would be compelled to act accordingly. And if Congress shall break up the present Union by unconstitutionally putting strife and enmity and armed hostility between different sections of the country, instead of the domestic tranquillity which the Constitution was meant to insure, will not all the States be absolved from their Federal obligations? Is any portion of the people bound to contribute their money or their blood to carry on a contest like that? "The right of the General Government to preserve itself in its whole constitutional vigor by repelling a direct and positive aggression upon its property or its officers cannot by denied. But this is a totally different thing from an offensive war to punish the people for the political misdeeds of their State Government, or to enforce an acknowledgment that the Government of the United States is supreme. The States are colleagues of one another, and if some of them shall conquer the rest, and hold them as subjugated provinces, it would totally destroy the whole theory upon which they are now connected. "If this view of the subject be correct, as I think it is, then the Union must utterly perish at the moment when Congress shall arm one part of the people against another for any purpose beyond that of merely protecting the General Government in the exercise of its proper constitutional functions.